We don't have to really be surprised about it anymore. Since Morbid Angel and now Death can't sell out the Noorderligt anymore, we can easily say that the once rearing death metal passion has run low. Yesterdays interests diverge more and more and adding a progressive band like Anacrusis to the bill shows that they are expecting this. Not a smart desicion maybe (who knows this band anyway), but death metal seems to be getting lesser and lesser priority. CREEPMIME, the first band, was in retrospect the absolute most death metal orientated band this evening. Although their excellent debut "Shadows" was produced by softy Mameli, this band cracks and I realized it the next morning when playing the CD. The fact that nobody was familiar, including myself, with their brand of death metal explains the halfhearted reaction this evening, but they nevertheless were good!! Especially the fine melodies, interwoven smoothly into the mainly slow heavy base, set an gloomy yet fascinating sphere, neither experienced as doom metal nor as pure death metal. Just special and efficient. These are the ingredients that fail, in my personal opinion, with ANACRUSIS. Even though the band already released four CD's, on an international level they are still patiently building upon some kind of underestimated cult status. Undoubtedly their relatively inaccessible sound is the cause for that. As well musically as with the vocals they are using theme's and arrangements that are (and this is putting it mildly), quite freakish. Apparently without fixed patterns, but obviously building on refined constructions, the band pulled themselves through the set. Although they were playing before a death metal audience they were not playing that many speedy, heavy tracks. On the contrary, even from the heroic debut "Suffering Hour" only the driving "Butcher's Block" was played while the progressive songs from the other releases also got a chance. Many were thinking, 'what is this?' Especially the quite unusual voice of guitarist/vocalist Kenn Nordi was a thorn in many ears. From dry talking to weird singing into (typical for him) screaming. Quite original and as obstinate as the music itself. Although I have to admit that though they fascinated me at times, it was not meant for me. Some bands are stuck to the underground forever and I'm afraid Anacrusis is one of them. DEATH isn't anymore though. Chuck's foolproof spirit already won his fans. He proved this to be quite right before a crazy crowd. 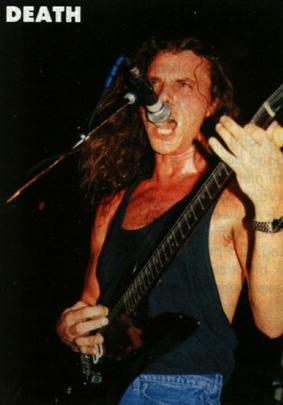 I was struck by the appearance of guitar player Craig Locicero, snatched away from Forbidden for the time being as an alternative for Ralph Santolla. He drew all attention by banging wildly and making fearful faces (next to a cool and concentrated Chuck). That he was entitled to do so he proved musically, because despite of all cheerful capers he managed to play flawlessly . Chuck obviously has an eye for musicians of genius, which are the only ones his brilliant music tolerates. Today the set was clearly focused on the more recent work with "Individual Thought Patterns" and "Human" being the main sources. But "Leprosy" and "Spiritual Healing" were also represented. Meanwhile all tracks from the unsurpassed "Scream Bloody Gore" album alas have been deleted from the repertoire. Not quite a decision to be praised but it's Chuck's band in the end. As usual the four exellent attuned musicians played almost perfect; Gene Hoglan was in great form, Steve DiGiorgio almost fused with his fretless bass and Chuck and Craig smoothly played solos next to each other. I somehow had the feeling Chuck did not have a good voice tonight, but this little defect could not spoil the enthusiasm. The sound, typical for Noorderligt events, was naturally sublime again, attentively balanced providing every musician with enough room. All in all a predictable but satisfying show tradionally ending with "Pull The Plug". Despite fierce cheering and yelling for more, Chuck did not return..... his job was done and he doesn't put in overtime anymore!